I’ve had this cushion on my to-make list for months. It always takes me a really long time to make design decisions for my own house–lots of sketches and fabric piles are involved. This cushion is in our home office (which is also where I sew), on the couch/guest bed (yep, the room is also our guest bedroom). This room is a busy place so I really wanted the design to be just right. I played around with lots of ideas, but inspiration struck when I ordered some of Carolyn Friedlander‘s new collection Carkai. I almost never buy a collection of prints, but I snatched up a bundle of half yards in Carkai and Doe. I really love subtle palettes of primary colors, if that makes sense. I ended up going with trusty flying geese (after all that thinking and sketching …)–I think they really show off the prints and keep the colors from being overwhelming. The cushion is a whopping 26×26, perfect relaxing and dreaming up my next project! This entry was posted in fabric, small projects and tagged Carkai, Carolyn Friedlander, cushion cover, flying geese on February 4, 2016 by brigitdermott. My guild, Gainesville Modern Quilters, decided to do a UFO (unfinished objects) swap and then make charity quilts with the exchanges. 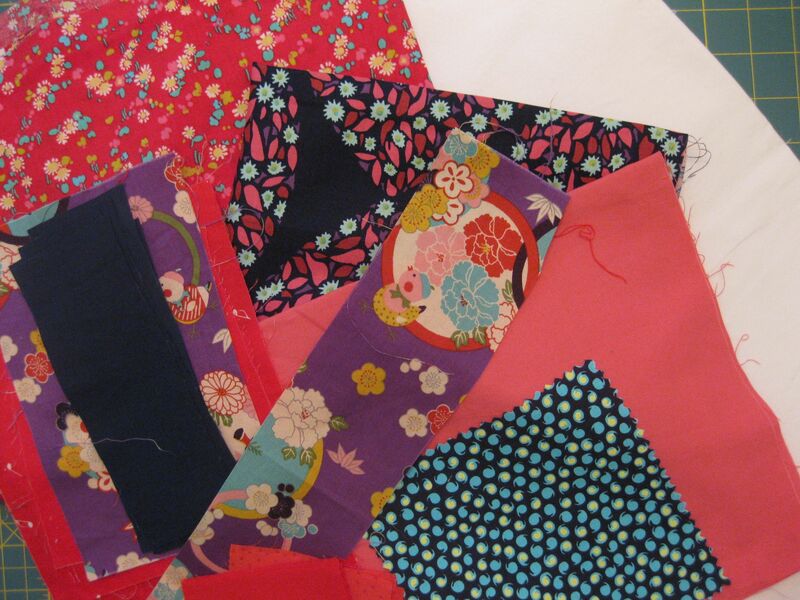 We plan to link up with SwimBikeQuilt’s 100 Quilts for Kids. 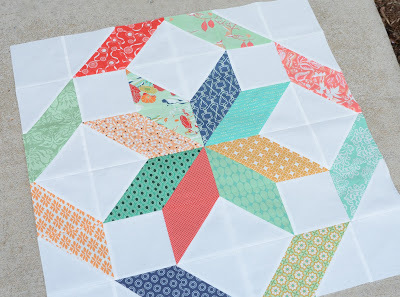 I chose this lovely block that was hand-pieced by Mary’s grandmother. I really want to make something special with this block. 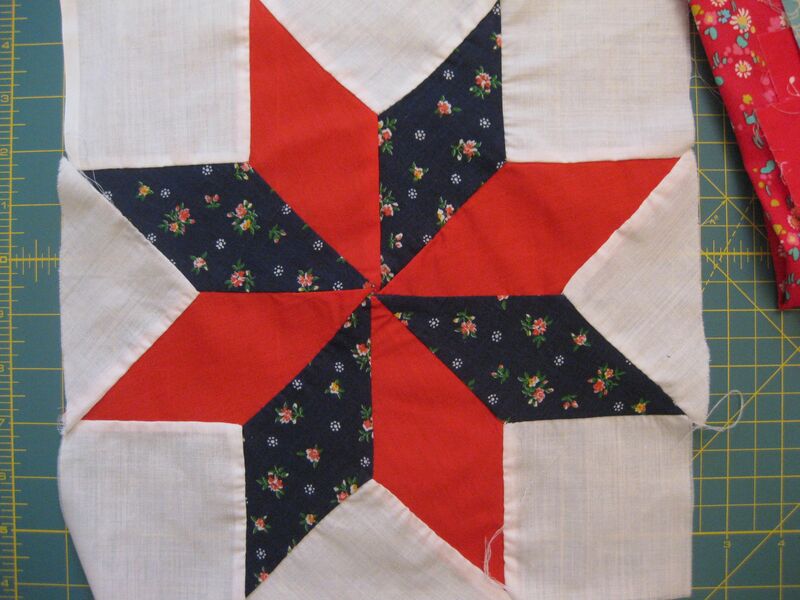 I was thinking that red and blue eight-point stars and some flying geese would suit the original design. But then I saw a very pretty star block on Hyacinth Quilt Design (from the book Simply Retro by Camille Roskelley) that I think might be just perfect. I also love the palette in this quilt from Spotted Stone Studio–I love the mix of navy and red with the soft pinks and gold–so pretty! Here are some of the fabrics I’ve pulled so far to work on this–and a big piece of white, which I plan to use lots of! I am really excited about this project. Taking something rooted in family and traditional quilting and making something modern is super appealing. Plus, I’ve been making quilts for my Etsy shop, which is exciting and fun, but making a quilt for a child in need is a very different feeling. I look forward to sharing my progress–which should be fairly rapid since we are meeting the first week in September to gather our finished quilts! 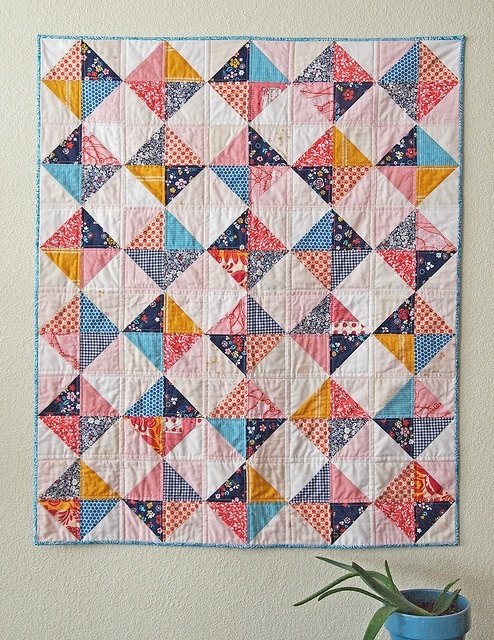 This entry was posted in inspiration, kids stuff, Modern Quilt Guild and tagged charity quilt, flying geese, kids quilt, modern quilting guild, red and blue quilt on August 7, 2013 by brigitdermott.